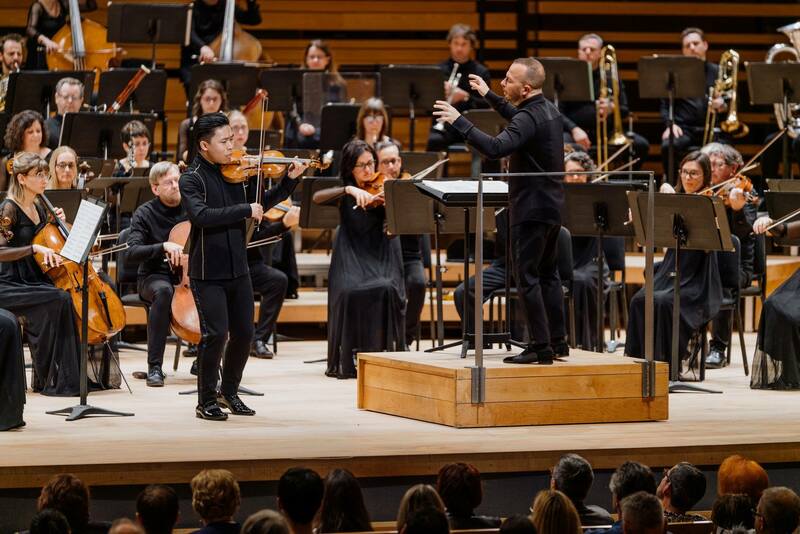 ...he plays with a finesse which is unheard of..."
In the 2018/2019 season, Kerson is Artist-in-Residence with the Orchestre Métropolitain de Montreal under Yannick Nezet-Seguin. Other highlights to look forward to this season include his debuts with the Sinfonieorchester Wuppertal, Liège Royal Philharmonic, Vancouver Symphony Orchestra, and London Symphonia. Kerson has played in some of the most prestigious concert venues around the world from Carnegie Hall’s Stern Auditorium and the Auditorium du Louvre to Wigmore Hall and the National Center for the Performing Arts in Beijing. He is in regular demand as a soloist, having performed with such ensembles as the Royal Philharmonic Orchestra, the Oslo Philharmonic, the Vienna Chamber Orchestra, the Stavanger Symphony Orchestra, the Orchestre National de Lorraine, the Kansai Philharmonic Orchestra, the Orchestra Gulbenkian, the Stockton Symphony Orchestra, the Toronto Symphony Orchestra, the Montreal Symphony Orchestra, the Orchestre Metropolitain de Montreal, the Quebec Symphony Orchestra, and the National Arts Centre Orchestra of Canada, as well as numerous other orchestras in his home country. Kerson is also an avid and passionate chamber musician. Since his debut at the Gstaad Menuhin Festival in Switzerland in 2011, he has been featured at many renowned international festivals and concert series, including the Verbier Festival, Rheingau Musik Festival, Festspiele Mecklenburg-Vorpommern, Fraenkische Musiktage, Flâneries musicales de Reims, Bergen International Festival, Trasimeno Music Festival, Schiermonnikoog Chamber Music Festival, Toronto Summer Music Festival, Ottawa International Chamberfest, Music and Beyond, Montreal Symphony Orchestra’s Virée classique, and Domaine Forget International Music Festival among others. Kerson released Bis, his first album for Analekta showcasing a collection of encore pieces, to critical acclaim. He recorded John Rutter’s Visions with the composer himself and the Aurora Chamber Orchestra for Collegium Records, after giving its world premiere in London, UK. He has also been invited by Canadian composer Francois Dompierre to record his piece, Les Diableries. Kerson can also be heard on CBC Television, CBC/Radio Canada, the BBC Radio 3, Radio France, Radio Television Suisse, American Public Media’s SymphonyCast, NRK, RAI, Deutschlandradio Kultur, and Czech Radio. He has been a recipient of many awards such as the Sylva Gelber Music Foundation Award (2015-2017) and the Young Soloist Prize 2015 by the Radios Francophone Publiques, as well as having received a Mentorship Award from the Lin Yao Ji Music Foundation of China for inspiring younger generations. He was named Revelation Radio-Canada 2014-2015 for classical music. Since 2015, Kerson has been an Artist-in-Residence at the Queen Elisabeth Music Chapel in Belgium, mentored by Augustin Dumay. Teaching is becoming a growing passion for Kerson, having given masterclasses and taught at various festivals and universities including the Indiana University Jacobs School of Music, the University of Ottawa, and Memorial University in St. John’s, Newfoundland. He has always been keen on making connections between music and other fields. Ever since his dad started introducing him to physics concepts about string resonance, they have strongly influenced his playing and philosophy on sound production. Together with his dad, he has given lectures about this subject in places such as the Central Conservatory of Music in Beijing, the Barratt-Due Music Institute in Oslo, and various universities in California.